Making New Year’s resolutions before the year begins is extremely common. Still, it is important because it defines your intentions to better your life. Unfortunately the breaking of these resolutions, or forgetting them by March also happens frequently. Resolutions that are flippant or imagined in a “what might be nice” spirit are rarely followed through with. Resolutions need to have a component that keeps you engaged with your goal, adding a promise can do that. Make a promise to yourself instead of just a resolution and you are more likely to accomplish your goals for the New Year. 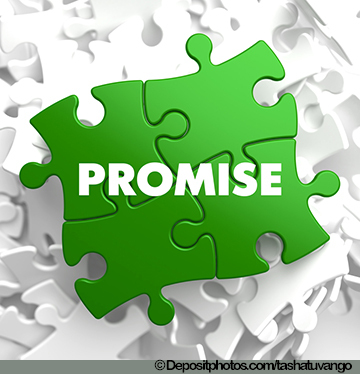 A promise represents a commitment to follow through with a specific action. Promises hold more weight than resolutions alone because they challenge your integrity and commitment. If you break a promise made to someone else, what does that say about you? Broken promises are linked in our minds to dishonesty and a lack of integrity. The same should apply if you break a promise to yourself. 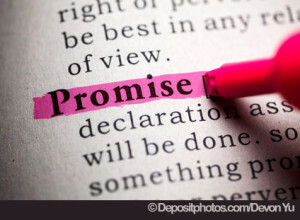 Because promises are held to a higher standard in our minds, we are more likely to uphold them. There is power within a promise because you are committing to yourself on a course of action. This is a big deal. Individuals do not intentionally make promises that cannot be kept. Making a promise to yourself means that you have weighed the options, considered what you want, and decided that your goal is a worthwhile venture. Furthermore, feeling strongly enough to make a promise correlates with motivation. If you are motivated enough, you are willing to make a promise to yourself. 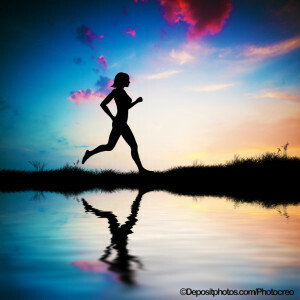 Motivation and commitment are extremely important elements to achieving any goal. Part of achieving goals is having a clear vision of what you want and moving away from what you do not want. (See this article for more about that.) So making a promise can energize you by making what you desire clearer and by adding something to void, breaking the promise. Of course making a promise should not be done lightly. If you break it it does not feel good. 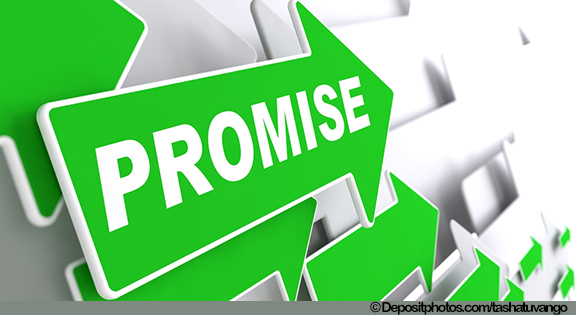 Still if you really want your goals a sincere and well-considered promise can set the stage for success. Also there is a process, or stages to go through before you can or should make a solid promise to yourself. So if you have a goal, consider where you are in these steps to see if you are really ready. To provide an example of the process, we’re going to talk about an individual who wants to lose weight. Possibility: At this point you have identified something you want to change. You are considering the possibilities of change, your options and the potential outcomes. This is the first step in making a promise to yourself. You’re beginning to consider a goal and imagine the possibilities. For example, you recognize that you’re overweight. You can imagine the implications of setting weight loss as a goal. You recognize that losing weight would be better for your health but you cannot seem to give up those Reese’s cups. You’re considering the possibilities of change and the costs/benefits to you. Proposal: After weighing your options and considering the outcomes you have begun to come up with proposals for change. You have some ideas about what you will need to do to achieve your goal but are not entirely positive about how to proceed. You’re considering options and proposing strategies to yourself about making a change. If you’re thinking about losing weight, for example, you consider stopping the Reese’s cups. Or you consider continuing with the Reese’s cups but exercising 1 hour every day. Proof: So now you’ve got some ideas about tackling your goals but you need to prove to yourself that this is really what you want to do. You may be wondering if it is really worth the effort to pursue your goal. Essentially, you have to convince yourself, or prove to yourself that this will be a worthwhile venture. There is some soul searching to be done prior to committing yourself to a promise. For someone who wants to lose weight, they start to consider if being healthier is really worth losing those Reese’s cups. They think about their willingness to exercise and stick with the plan for longer term health. If the decision is these goals are worth it, and you have considered the pros and cons, there you have your proof. Authenticity: Authenticity is another important aspect in promise making and goal achievement. A goal that is inconsistent with who you are is destined for failure. Goals need to be set on what we fundamentally want to achieve, otherwise the entire effort will be a challenge against ourselves. Being authentic is important to developing goals and making self-promises. If what you have considered, proposed to yourself, proved to yourself is valuable to pursue, and is consistent with your authentic self you are ready make a promise to yourself. Promise: If you have proven to yourself that this is what you want to achieve and committed to this goal, you are ready to make a promise to yourself to achieve it. You are ready to commit yourself to the process and set of steps that will be necessary to achieve your goal. The promise is best focused on the process or the specific steps you will take, as opposed to the outcome you want, even though the outcome you want is clearly in your mind’s eye. An individual who wants to lose weight makes a promise to eat less, exercise more, or follow some program for three months. This is a more effective promise than “I will lose 20 pounds in 3 months.” Yes, you want to lose 20 pounds and you more likely will if you keep your promise to the process! A promise, like a goal, should be specific and time limited. It can then be evaluated and set again. Planning: Once you have made the promise to yourself you then need to make plans to achieve your goals and keep your promise. You likely already have a plan by this stage, but now is the time to refine your plan. You need to prepare yourself for the future and take the steps needed to achieve your goal. A promise to yourself is empty if you don’t plan for the appropriate actions to achieve it. As per the previous example, a weight loss plan would need preparation for meals, an exercise plan or another specified plan to ensure the individual is making strides towards the completion of their goal. Taking the steps to make a promise to yourself is setting the foundation for future goal attainment. You are clear about your aspirations and desires. You are committing to yourself, and holding yourself accountable for your future actions. Don’t make the promise until you are ready. But when you are ready this promise is very powerful. A promise to yourself is an affirmative to ensure that you stick to your goal and work towards building your future. Make a promise to yourself and fulfill the “promise” you know you possess. You are worth becoming a better you in 2015! As humans, we all have an innate growth drive. It points us toward being better, moving forward and driving toward something higher. Basically, it’s something inside ourselves that drives us all to want to be the best version of ourselves possible. How we do that is by engaging in a cycle: putting in effort, being inspired by the results, and continuing to put in more passion and effort. But sometimes life happens and the “mission” is interrupted. Life transitions and changes, either good or bad can interrupt progress. It can be something wonderful, like having a baby or getting married. Or it can be something difficult like losing a job or something heart-breaking – like the loss of a loved one. And then press play again…. But the thing is: you can only press play when you’re ready; until then one track of the symphony stops as the rest of life plays on. This happened to me. The happy ending is that I emerged inspired, passionate and itching to move forward – but in no way was it easy to press play and restart. It was so challenging to get the inspiration to press play again. When it happened, it happened suddenly. It was like the dust settled and vroom – my growth drive kicked in again! I pressed pause on my growth oriented projects of pursuing my passions. The projects meant to make a difference for more people by supporting their growth, healing, and transformation. The projects expressing my creativity and heart. Projects had been started, but not finished. Dreams dreamt but not realized. The fire was dampened, pause just happened, until rekindled. Looking back now, the reason for my pressing pause was big. Rosemary, my wife and business partner passed away. After that whirlwind of grief, confusion and sadness, I slowly learned to have fun again and a new, wonderful woman, Nancy, walked into my life. For over two years I was swept up in mixed emotions, the day-to-day tasks of my career, and learning the nuances of my new life. Life went on. But one important track stayed on pause. Once I was ready, after processing all the changes, recalibrating, reflecting, and feeling grateful for new possibilities, I began take the steps to move forward and press play again. At first, when the growth track started playing again, I was critical of myself for pausing. Fortunately I chuckled at the foolishness of that thought! I had an epiphany of sorts and realized that my personal and spiritual growth did not pause– only one track paused. I felt a warm sense of gratitude through my entire body for what was learned: I emerged a richer, wiser, and deeper person because of those experiences. Perhaps the higher mission was not interrupted after all. Here’s the lesson for you: sometimes your growth drive pauses. Life is full of transitions that change your trajectory for a time. Growth still happens when you are busy with dealing with the other tracks of your life. It is inevitable that sometimes certain tracks of your song pause. That is okay. You will press play again when you are ready. 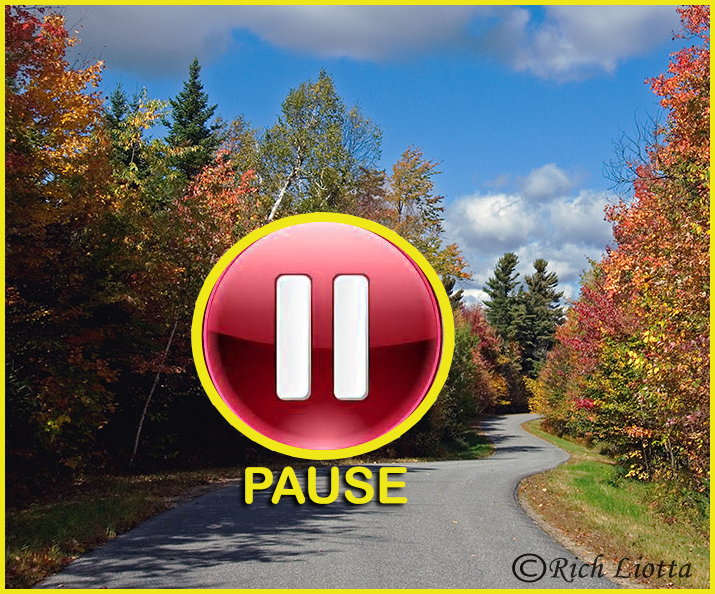 As you press play again, remind yourself that the pause is a positive thing. It does not stop your progression and growth drive. 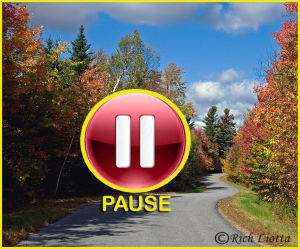 Somehow the pause did serve your personal and spiritual growth. Trust that it was a step in the process of getting you to where you want to go. Often, the pause is right before the big breakthrough. You’re on your way to feeling more alive, more inspired, more driven, and oh yes- more positive! The pause is the time right before the emerging clarity and resolution when we leave a period of our lives behind. Remember: insight occurs when confusion subsides. 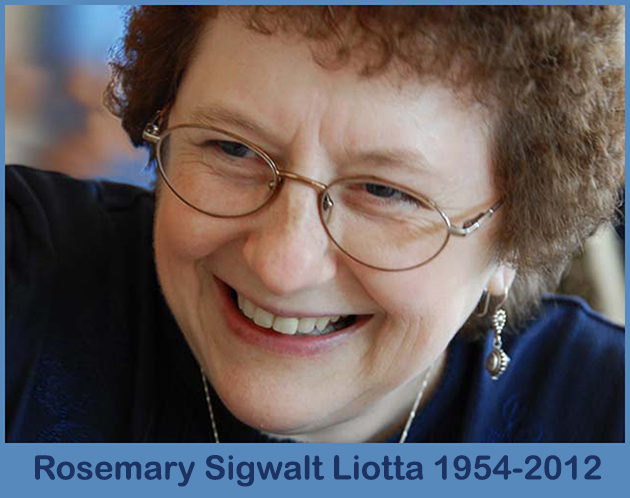 I have been thinking about Rosemary (Rosemary Sigwalt Liotta) a lot lately. Perhaps because it is the holiday season, which she always loved. Perhaps because I am reviewing the projects we shared. Likely it is both and more, because she is always in my heart. It has been over two years now since she left this world. Rosemary was one of the most intuitive and wise people I have known. Her commitment to and talent for helping others was extraordinary. Living and learning together were experiences that have contributed to my evolution; and they still do. Ideas generated together in lively discussion still grow in my work. I eternally grateful for the time we had together. ~Life is a passionate adventure with no guarantees for anyone. ~Things are always changing… nothing really stays the same. ~All anyone has is right now, this minute. So live each minute and each day as if it were your last – it may be. ~Life is best lived simply. All anyone has is their time and energy. Abundance is found in aligning life in harmony with this. ~Trust Spirit and Learn. All who wander are not lost. They are learning. ~The path to self growth and spiritual growth is always an enlightening one. Be a humble learner on your life’s journey. ~Cherish the simple things, feel deeply, love fully; because life is an incredible journey. I believe that wherever Rosemary is now she is continuing her work, on a higher plane, unencumbered by the challenges of this one. Diamond Days are those days in your life that are especially precious and that remind you of the value of life and the joy of experiencing it fully. Diamond Days take many forms, they can happen in any aspect of your life. Perhaps it the thrill of a day when everything flows in your business and career. Perhaps it is a day when your connection with someone you love was exquisite. Perhaps it is a day when your spirit intermingles with the universal. Or perhaps it is something else entirely for you. Like the diamond’s many facets, possibilities abound. Wealth and abundance is the collection of “Diamond Days” and memories that you hold in your heart. Diamond Days energize the spirit and set the stage for a bright future. “Perceive the world with appreciation in your heart and an attitude of abundance and many diamond days will be be yours!” So create your own Diamond Days. The video was inspired by an Adirondack Diamond Day. This Enrichment Meditation takes you on a journey through a Diamond Day, a precious and spiritual day, in the Adirondack Mountains in the fall. This meditation combines images, music, and narration to stimulate and move you in positive directions. My hope is that inspires you and reminds you of your Diamond Days! The holiday season is a good time to pause and reflect on the many people, things, and circumstances we all have to be grateful for. The Gratitude Book Project: Celebrating 365 Days of Gratitude aims to encourage readers to do just that—but to also extend that practice beyond the traditional season of giving thanks and showing appreciation. I’m very excited to be a part of this book! Gratitude is so critical to well-being, motivation, happiness, and discovering the full meanings in life. 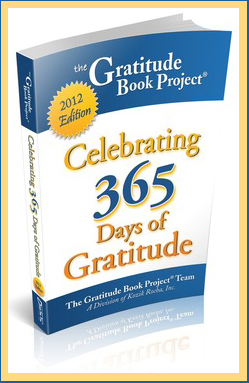 This book will encourage you to remind yourself about what you are grateful for every day. My entry is about Precious Moments and the life embracing choice to notice and appreciate the precious moments in daily life. These books make great holiday gifts for friends and family and the book is a wonderful way to remember to count our daily blessings. I hope you will join me in supporting these organizations and in keeping gratitude in motion throughout the year. 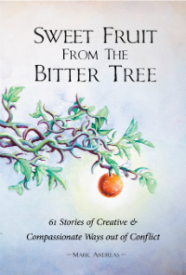 Sweet Fruit from the Bitter Tree: 61 Stories of Creative & Compassionate Ways out of Conflict by Mark Andreas! Rosemary’s story from the book was featured on Steve Andreas’ Blog. This is a passionate and moving story of courage and the influence of language. It’s a great example of entering another person’s world through mirroring — and much more — in an extremely dangerous situation. 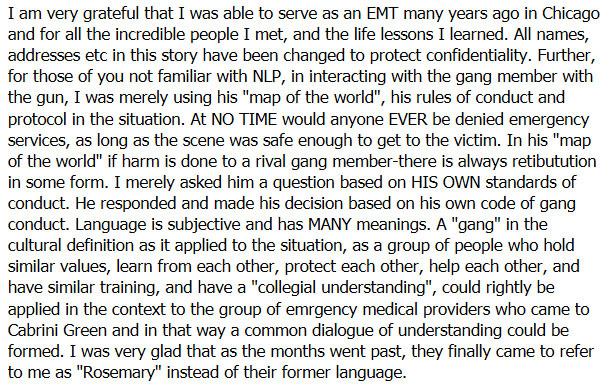 We think you’ll enjoy this story, from Rosemary Lake-Liotta, sharing her experience working as an EMT in tough neighborhoods. Her response was the opposite of the classic instructions in such situations. You are usually told to respond to conflict with placating words like “let’s all calm down and discuss this rationally.” I think you can easily imagine how that would have worked here. You can read Words Save Lives here. Steve Andreas posted it on his blog. The book is full of valuable stories! You can read more about the book at this website, SweetFruitBook.com. You can also purchase it on Amazon. The idea of the whole thing is that all of these processes [Reflecting, Appreciating, and Creating] facilitate Doing and also facilitate Abundance. We feel that appreciation is really an energizer. Appreciating yourself, appreciating other people, appreciating various things in your life is really appreciating some of the abundance that exists out there; and that appreciation creates energy, which is going to help bring more positive things to you in your life. 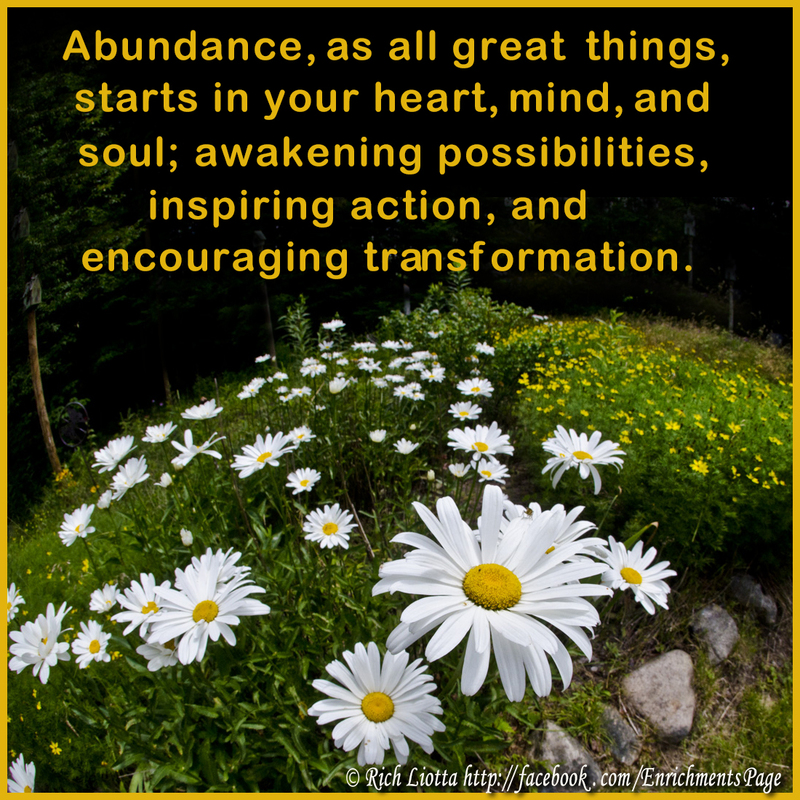 Not necessarily in a purely law of attraction type of way because I think, at least by my way of thinking, one of the things missing from the law of attraction, though it has a lot to offer and a lot of good messages, is okay – what about the doing? Is all this going to be, if you just believe it strong enough it’s going to manifest? Well maybe, but generally it’s really difficult to believe something that purely; and second, it’s often doing that is going to bring more opportunities to you. Both in a practical way, whether you think about it in terms of the higher energy of the universe way of thinking about it, but just practically if you’re out there doing things and interacting with the world it is more likely that things are going to come to you! 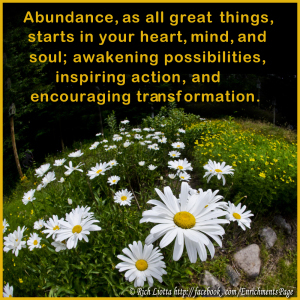 To read more see the article on the 4 Practices Necessary to Achieve Abundance and explore other articles on this site. More posts are coming soon.